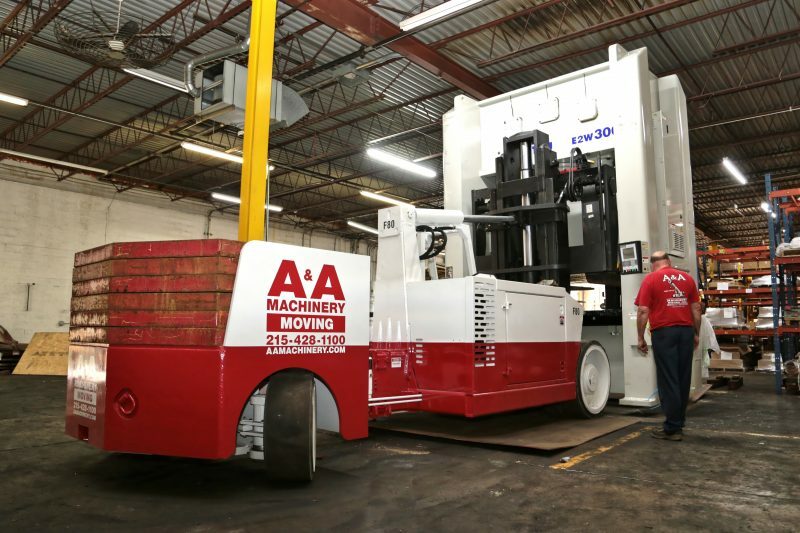 A&A Machinery’s 30+ years installing, removing, and relocating manufacturing equipment of all sizes and shapes is one of the many reasons the team was called upon by this local tool manufacturer. They wanted an experienced and safe rigging team to handle their newest asset. 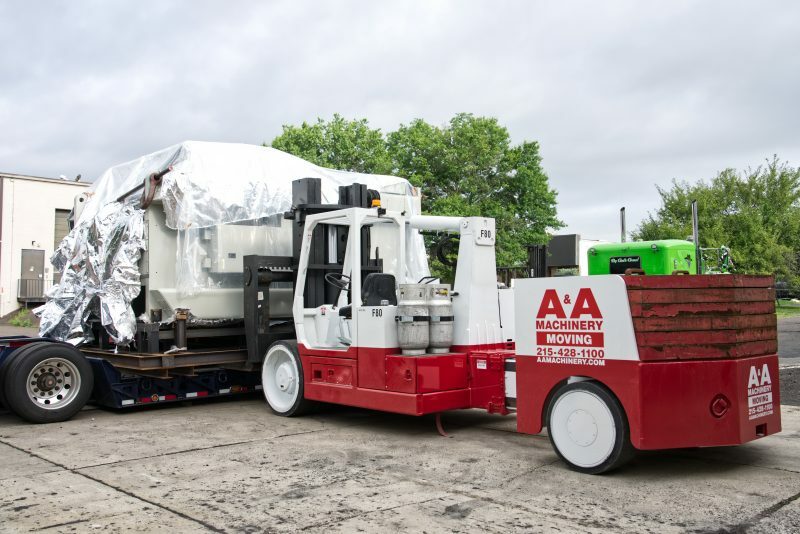 As this Greater Philadelphia Area metal fabricator and metal engineering supplier continues to grow, so does their manufacturing equipment and capabilities. 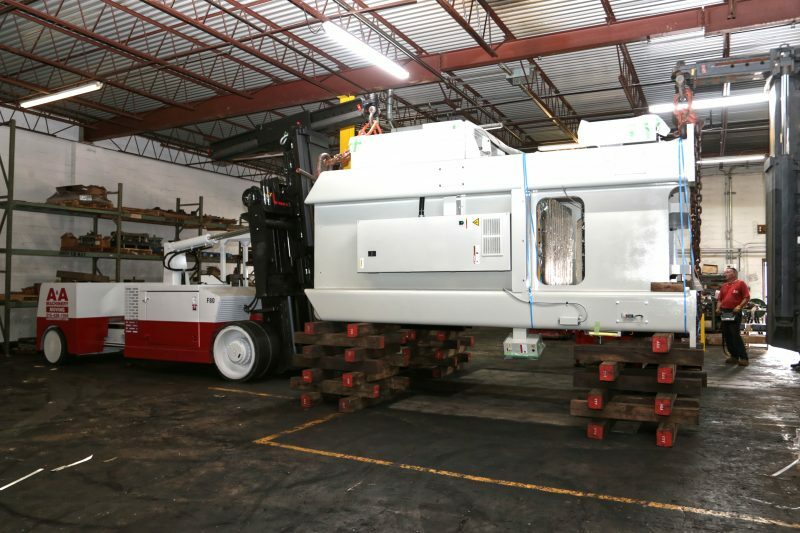 A brand new 300 Ton straight-side mechanical press was purchased by the company. Ordering the new press was no problem for our customer. The real work started when the new press was ready for delivery and the press being replaced needed to be removed. The company looked to A&A Machinery Moving to provide turn-key service removing and replacing the 300 Ton press. 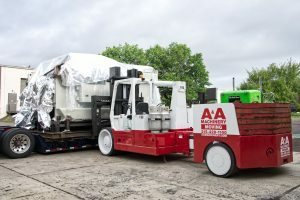 Prior to placing in location the brand new 300 Ton Komatsu Straight-Side mechanical press purchased, the A&A crew was tasked with disconnecting, dismantling and removing the current press in its place; a 300 Ton Bliss press. The Bliss press being removed weighed 80,000 lbs. Electrical and air lines between sections were disconnected, bolster plates were removed, and the Ram was lowered and removed. Our crews then removed and disposed of the 300 Ton Bliss press from its location. This would clear the area so the foundation could be prepped for the new 300 Ton press. 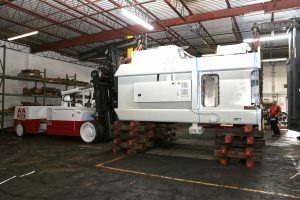 The 300 Ton Komatsu press was the newest addition coming to the facility. At a weight of 101,000 lbs. and a height of 16 ft., there would be little overhead room in the facility to stand the press up. Overhead beams in the ceiling prevented certain rigging maneuvers. This required some key planning by the A&A crew. Two 60/80 Versa-Lifts worked in tandem to pick and unload the press from the 8-axel double-drop trailer. Each Versa-Lift was operated remotely by our crew for better visibility without losing precision. This was also the first job for our newest 60/80 Versa-Lift model added to our fleet. 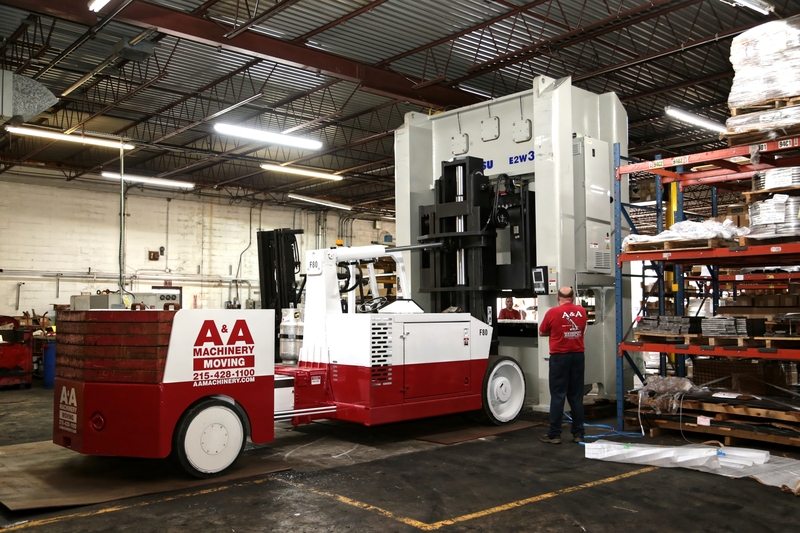 After unloading the press, our crew determined it would be better to maneuver the 128 in. x 109 in. x 189 in. press within the facility if the crate and skid the press was shipped on were removed. 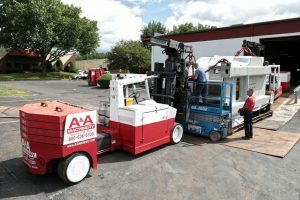 Even with the skid removed, our crew had only inches to spare on each side of the press when transferring the lift through the entryway of the facility. Steel plates were placed along the planned travel route throughout the parking lot to minimize damage and create a smoother surface for the Versa-Lifts to travel on. A Hyster S-155 forklift was used to unload and place these steel plates along the parking lot. 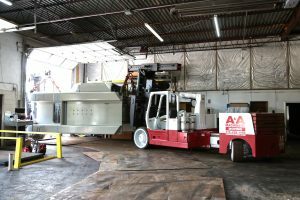 With a hydraulic boom attachment and rigging shackles on each 60/80 Versa-Lift, the lifts worked in tandem to transfer the 300 Ton press into the facility and prep the press to be placed in location. When transferring the press into the facility, the crew had to take into consideration the incline of the ramp of the entryway, avoiding any damage to the press. Before standing up in location, cribbing was placed underneath the press, allowing our operators to change their pick points on the press and any necessary rigging equipment. With little room to spare between the top of the 16 ft., 101,000lb. press and the beams in the ceiling of the facility, our crew successfully placed in location the new 300 Ton Komatsu press.